Sir Max Hugh Macdonald Hastings FRSL FRHistS (/ˈheɪstɪŋz/; born 28 December 1945) is a British journalist, editor, historian and author. His parents were Macdonald Hastings, a journalist and war correspondent and Anne Scott-James, sometime editor of Harper's Bazaar. Hastings was educated at Charterhouse School and University College, Oxford, which he left after a year. Whilst most of his immediate family were educated at Stonyhurst College, it was his cousin Sir Stephen Hastings who became his abiding ally. He then moved to the United States, spending a year (1967–68) as a Fellow of the World Press Institute, following which he published his first book, America, 1968: The Fire This Time, an account of the US in its tumultuous election year. He became a foreign correspondent and reported from more than sixty countries and eleven wars for BBC TV's Twenty-Four Hours current affairs programme and for the Evening Standard in London. Hastings was the first journalist to enter Port Stanley during the 1982 Falklands War. After ten years as editor and then editor-in-chief of The Daily Telegraph, he returned to the Evening Standard as editor in 1996 until his retirement in 2002. He received a knighthood in 2002. He was elected a member of the political dining society known as The Other Club in 1993. He lives at Hungerford in West Berkshire with his second wife Penny (née Levinson). Hastings has a surviving son and daughter by his first wife, Patricia Edmondson (divorced 1994). In 2000, his 27-year-old elder son Charles took his own life at Ningbo in China. He dedicated his book Nemesis: The Battle For Japan 1944–45 to his son's memory. In 2015 Hastings was accused of plagiarism. It is alleged that he lifted large sections of another academic's work, and failed to attribute them. Hastings has supported both the Conservative Party and the Labour Party. He announced his support for the Conservative Party at the 2010 general election, having previously voted for the Labour Party at the 1997 and 2001 general elections. He claimed that "four terms are too many for any government" and described Gordon Brown as "wholly psychologically unfit to be Prime Minister". In August 2014, Hastings was one of 200 public figures who were signatories to a letter to The Guardian opposing Scottish independence in the run-up to September's referendum on that issue. "The Tory defence policy will be simple: cut, brutally". The Spectator. 312 (9464): 14–15. 16 January 2010. Retrieved 3 November 2010. ↑ "- Person Page 668". thepeerage.com. 1 2 "Biography". Max Hastings. 2013-01-18. Retrieved 2014-08-25. ↑ Lloyd, John (29 July 1997). "Secret members of the Other Club". The Times. p. 13. 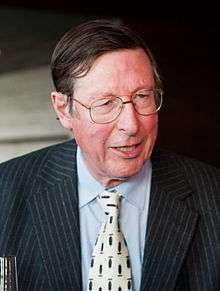 ↑ "Britain's Max Hastings wins $100K military writing prize". CBC News. 19 June 2012. ↑ Frank Walker (2 December 2007). "Mutinous jibe angers veterans". The Age. Retrieved 2007-12-03. ↑ van der Vat, Dan (13 October 2007). "Review: Nemesis by Max Hastings". The Guardian. Retrieved 9 February 2014. ↑ Howard, Michael (3 October 2007). "The worst of friends". The Spectator. Retrieved 9 February 2014. ↑ "My vote". guardian.co.uk. 11 April 2010. ↑ "Celebrities' open letter to Scotland – full text and list of signatories | Politics". theguardian.com. 2014-08-07. Retrieved 2014-08-25.